Babies that start out with gentle chiropractic care have the best chance of having the best life possible. 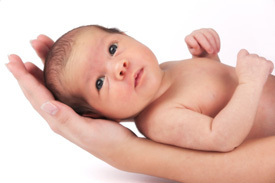 We strongly recommend that newborns be checked as soon as possible for spinal misalignments. It can make all the difference in the world in your child’s development! Regularly adjusted kids are happy kids! If you’re a parent, you can testify to the many bumps, bruises, scrapes, concussions and broken bones that children are prone to! These physical impacts have a cumulative effect on the body, and can result in physical or behavioral symptoms that often seem unrelated. The efficacy of early chiropractic intervention in children has been demonstrated through research. Did you know that kids who have regular chiropractic care have 75% fewer sick visits to the pediatrician? This statistic was shared by board certified pediatrician, Dr. Eric Rydland of Kendall, the Founder and Director of kidsWellness® Incorporated. We are honored that Dr. Rydland has sent our office 300 cases over the years! How Often Should My Child Be Adjusted? For the best chiropractic pediatric care in Miami, contact us today!